I remember well when Google started becoming a Personal Information Manager. In the early days it was a big secret. Around 2006 or so, we got an invitation to a secret meeting on Google campus. I flew down with an engineer and in a room of 60 fellow attendees we learned about Google Calendar. That was 2006. Google Calendar works great now. Gmail works good. They started a Task App, and then abandon it when it was half formed. Every other PIM tool ever created has priorities and categories for tasks. Not Google. After the second year, Google Tasks seemed relegated to the back burner while still half finished. More recently Google brought out Google Keep (no API) and Google Reminders (no API). Suddenly this week, the focus is back on Google Tasks. Gmail has acquired a new interface, and as part of that an integrated tasks panel. Just go to Gmail and go to Settings, Use the new interface. As a part of this, you can now drag and drop an email to become a task. Just like Outlook 2002 did (and still does). It’s almost as if Google’s Engineers finally checked out the Windows PC in the locked room. Google has also brought out a Standalone Android app for Tasks, called Tasks. You can recognize it from all the other Task apps because it’s from Google, LLC (because incorporation costs too much for a tiny operation like Google). Of course, with Google Tasks you still can’t assign priority, category or color. But at least you can see them on your phone now. All your Outlook Contacts, Calendar and Tasks will go to Google and to your phone if it sees your Google Account. All your Google Contacts, Calendar and Tasks will come back to Outlook. The easy secret smart businesses use to avoid paying Microsoft a monthly fee for Outlook, Word, Excel and Powerpoint. Portland, Ore – Kudos for Microsoft in keeping the ability to purchase Microsoft Office outright. Clearly their company focus is on driving subscription revenue. They are not the only company to do this. But it is a double-edged sword. While it may make shareholders happy to see increasing revenue, it also puts the onus on Microsoft to introduce features and services that have value to business people. Microsoft Office has achieved rare dominance in the professional world. A businessperson’s standing with customers requires presentations in PowerPoint and documents in Word. However, like Comcast, Microsoft products are not dramatically different than ten or twenty years ago. Bold and Underline is the same. Outlook contacts have not gained any more usefulness. Task priorities still do not handle Franklin Covey techniques. So why does Microsoft think you need to pay $12.50 per month for something you can buy outright for $229? I have owned a business for 31 years, or as I commonly say, “through four of the last three recessions.” I pay hard costs when the economy is good and run lean during the downturns. I buy furniture, equipment and software that lasts, and then milk it when I need. Half the battle of staying in business is to survive the unexpected; the snowstorm that closed our office for two weeks, the 9/11 shutdown of all domestic aviation, the unexpected lawsuit and the IRS audit. Surviving the unexpected means when business veers to idle, our monthly operating cost drops closer to zero. You cannot do that if you are paying a monthly fee to a vendor that is not providing significant ROI. Moore’s law ensures that technology becomes cheaper, faster, bigger and less expensive. The only rising cost I have is personnel and benefits which rise with the growth of the economy. 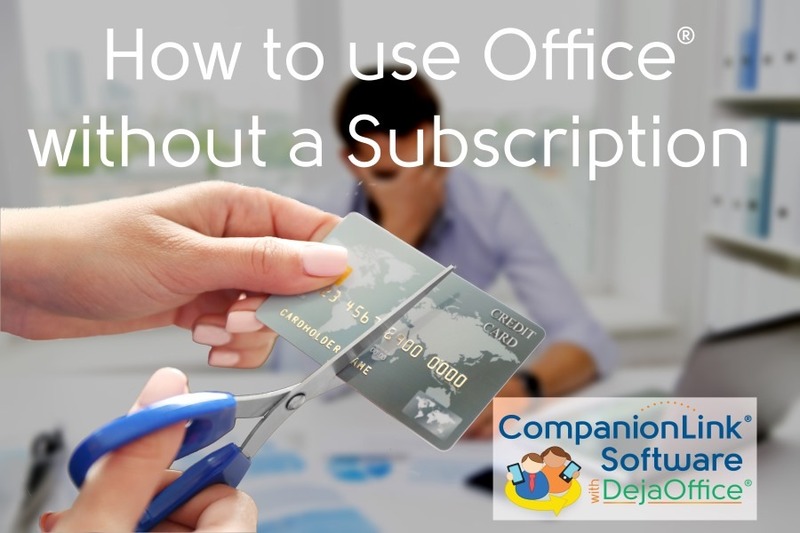 If the features you need for Microsoft Office and Microsoft Windows is inherently the same, then it should be optional for you to pay for Microsoft’s expensive service model, not a requirement. CompanionLink has published a guide for people who want to “cut the cord” and free themselves from Microsoft’s subscription model. The guide covers how to capture your data locally, how to set up local email, and how to purchase a one-time license to the appropriate Microsoft Office version. You can read our guide here. 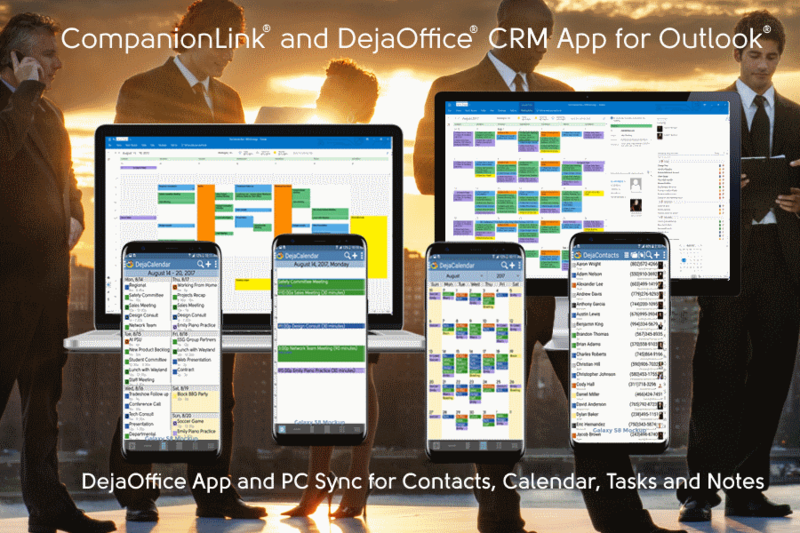 CompanionLink® Software, Inc. is a pioneering developer of data synchronization solutions for mobile phones and CRM software and services. They also develop a DejaOffice® for Outlook® App which runs on Android™, iPhone®, iPad®, Windows Phone®, and BlackBerry® devices. For 30 years, CompanionLink has helped mobilize information across devices, computers, applications, and web-based services. For more information, please visit www.companionlink.com and www.dejaoffice.com. CompanionLink, DejaOffice and DejaCloud are registered trademarks of CompanionLink Software, Inc. Other product names are trademarks or registered trademarks of their respective owners. Why can’t Outlook App actually work like Outlook? To sync Outlook to Galaxy S9 without needing an Office 365 subscription. 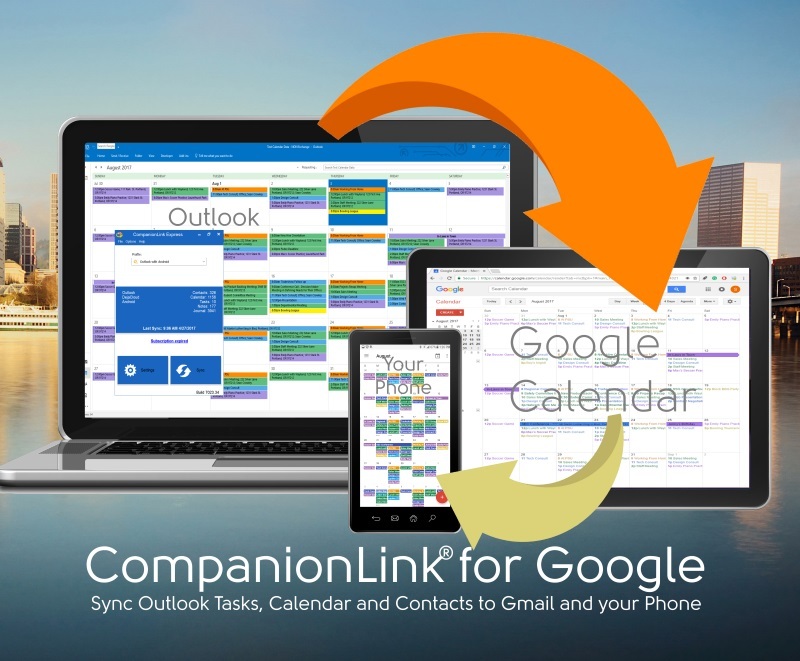 On your PC, download CompanionLink for Outlook on your PC. Samsung Galaxy S9 is the latest flagship from the world leader of Smartphones. There’s nothing faster or more effective. Here I have an argument with Apple. With iPhone there is no Widgets, and Widgets are so useful, you’ll never catch me using a phone without them. What is a widget? A widget shows App information on the phone desktop. A widget allows me to quickly see my day view, and my contact list – without opening an app. I can quickly tap on the location and get to my next appointment. No search, no scroll. Just one tap and I’m in maps. One tap and I can call or sms. Automatically updated all day. Persistent alarms to be sure I don’t miss anything. Check out https://www.dejaoffice.com for more information. With iPhone X, we finally enter the era where phones are REALLY more expensive than computers. More importantly, we enter an era where every phone vendor is REALLY making money farming your data on the phone. Every service, and every piece of information on the phone, including your location as you move around, and your browser history, is considered free fodder for the vendors to consolidate and sell to the highest bidder. One thing you can do, is turn off all the public information settings. Set your phoen to private, deny any information gathering by Microsoft, Apple and Google. Go into your account on each of these services and turn on the privacy settings. Finally, and most importantly, don’t use iCloud, Exchange or Google to transfer your valuable company information to your phone. CompanionLink provides a great alternative. CompanionLink is dedicated to keeping your data private, and also making it easy to sync to your phone. With CompanionLink software, you can use USB, Wi-Fi, Bluetooth and DejaCloud sync to send data directly from your PC to your Phone without hitting any cloud service that farms the data for profit. On the phone, we feature DejaOffice CRM App. This is an App we wrote, because our perception is that phone calendars are feeble. On the iPhone, the month view doesn’t show you anything about your data except a dot. On the iPhone, to see a week schedule you have to turn the phone sideways. On the iPhone, if your appointment rings and you are away from the phone, there’s nothing further to remind you, until you are way too late for your meeting. With DejaOffice, Day, week and month views have all your data, and are just one tap away. With DejaOffice, persistent alarms make sure you get notified when you get back to your desk, so you don’t miss your meeting. With DejaOffice, when you go on a trip, your calendar doesn’t go haywire the minute you land in a different time zone. If you have any questions, give us a call. Unlike ANY of our competitors, we are happy to pick up the phone: (503)243-3400. Outlook on your PC is primarily an Email too. You want to quickly intake, process and reply to emails. Your phone, however, is a mobility tool. You want to be reminded of your appointments, get directions, and quickly call or text people to smooth your schedule. 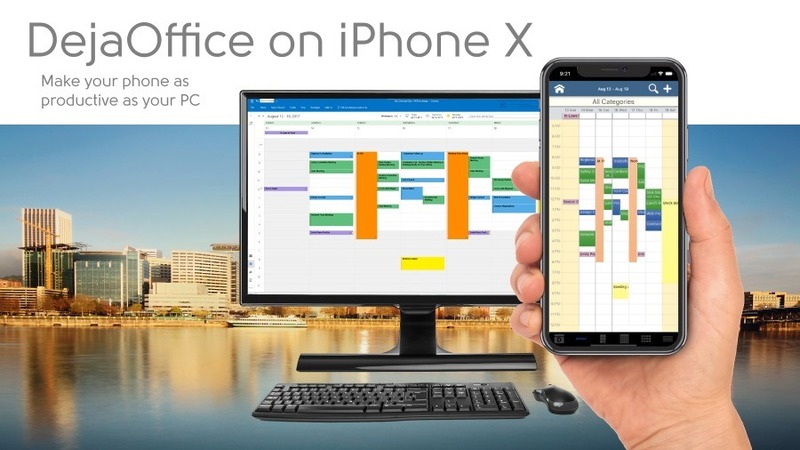 What would have made a lot of sense, is if Android and Apple had gone to Microsoft and said “Hey you have a lot of people using Outlook, so let’s work together to make a mobile version of it.” They didn’t, however. In fact, nether Android or Apple development teams ever used Outlook. Google (developer of Android) is primarily a linux shop, and Apple is; well Apple. MY PHONE IS NOT MY PRIMARY EMAIL DEVICE! In fact, I find email on the phone very awkward. And I don’t care how much you change the flow and focus, I really don’t do much more on my phone than just read my email until I can get to the office to process it. What I do on the phone is carry it, answer it, have it remind me of stuff. For these tasks, the Outlook App is really basic. That’s why it’s great that there is DejaOffice! 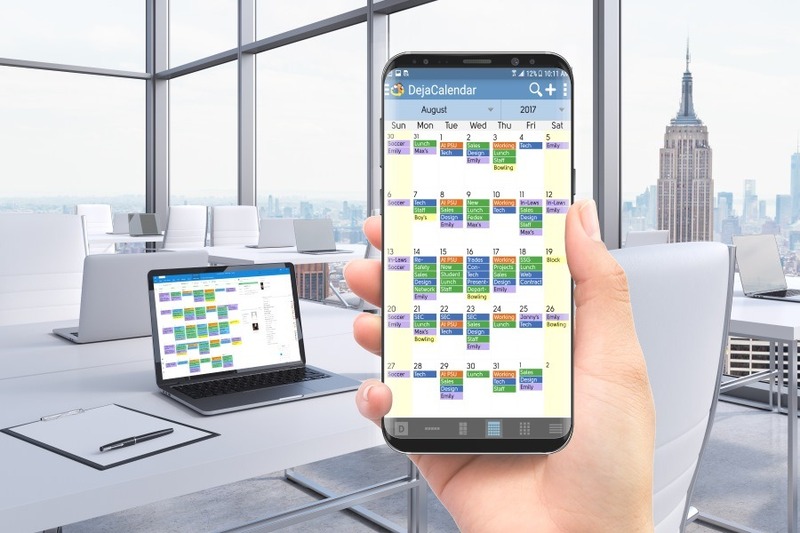 DejaOffice does all the things that Outlook on the PC, but it does it in a mobile way. For instance, appointment reminders are persistent, just like on the PC. They ring quietly every few minutes, until I dismiss them. My DejaOffice Calendar has all my colors. My DejaOffice appointments all have locations. And My tasks are easy to add and check off. Finally, everything I do, including text messages, are put into Journal so I have a record. On the PC I use CompanionLink Express with Real-time Sync through DejaCloud. This instantly transfers my Contacts, Calendar, Tasks and Notes from Outlook to my DejaOffice on Android. If I make a new appointment in DejaOffice, it goes to Outlook through DejaCloud within five seconds. No waiting, no duplicates. Definitely a boost to my mobile productivity. DejaOffice is available for Android and iPhone. It’s a free download. Check it out. We’ve all done it. Come in on Monday with a fresh attitude, get busy working, and finally open our Calendar, only to see that we missed an important event an hour ago. How about having your online calendar displayed fresh on your computer first thing every day? DejaDesktop Calendar Wallpaper can do that. It is a PC and Mac app that can move Google’s Calendar and Contact to your Windows and Mac screen backdrop. Every day, when you first look at your PC, you will see your updated Agenda. 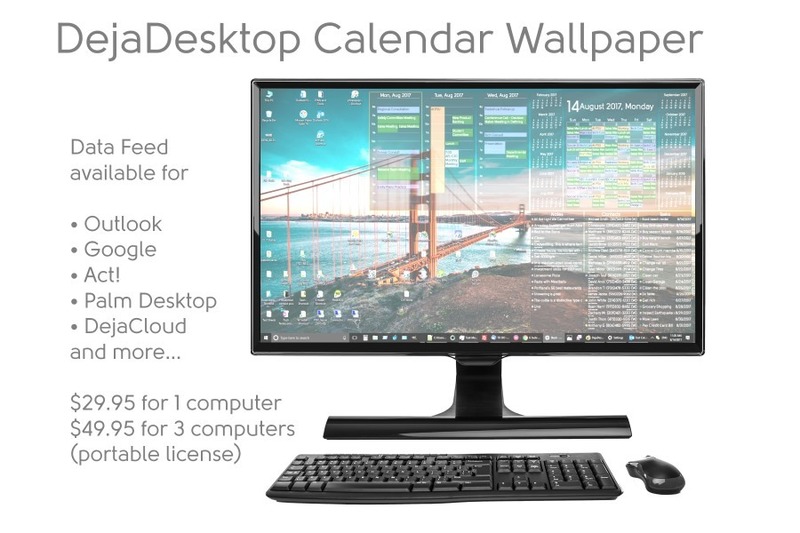 DejaDesktop Calendar Wallpaper is free if you just need the month view with the look ahead months. There is a two-week trial for the Outlook and Google data feeds. The software works by keeping your current schedule on your local PC, and burning today’s calendar into your screen backdrop picture. It will automatically update whenever you change your Calendar. The data feed for Google is a one-time purchase. You can buy it for one computer for $29.95. For three computers, you get a discount for $49.95. This is a lifetime license with no subscription or renewal fees. DejaDesktop is created by CompanionLink Software, a leader in synchronization tools. CompanionLink is based in the US and offers free technical support for its products. For more information see https://www.dejadesktop.com.